When previewing this post on my predominantly monochrome blog, the lurid orange of these gems came as a bit of a visual shock to the system. However, the colour is true to the originals which are in perfect condition. Presumably a husband and wife (both photos came from the same estate), these are lenticular photos. My one other example of this rare type of photobooth item can be seen in this earlier post. These 1940 World’s Fair Movie-Of-U souvenirs are made up of three exposures taken in succession on the same frame. The frame is placed under a lined sheet of acetate and when tilted appears to show movement. In the flat position needed to make a scan of these images, it is not possible to capture the images separately. When in action, the movement is fluid and really looks like a mini-movie. In some ways they could be seen as a primitive version of the Graphics Interchange Format (GIFs) I used in earlier posts this month. 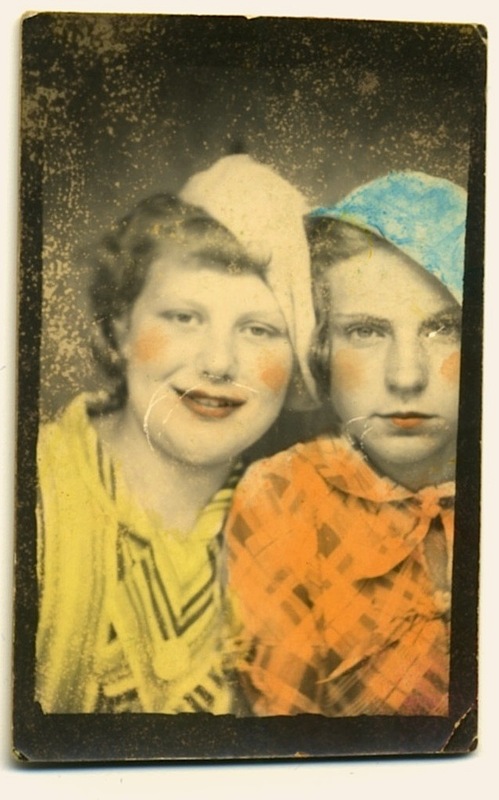 There is something about this photobooth diva that reminds me of one of national treasures, Ms Kylie Minogue. (See pictures, below.) Affectionately known in Australia, as Our Kylie, the dininutive singer has also, at various times in her career, been tagged with the honorifics Goddess of Pop, Princess of Pop, Disco Queen, and the less than flattering Singing Budgie. And like Kylie, isn’t this lady cute, cute, cute? This strip dates from the 1950s and originated in the U.S of A. 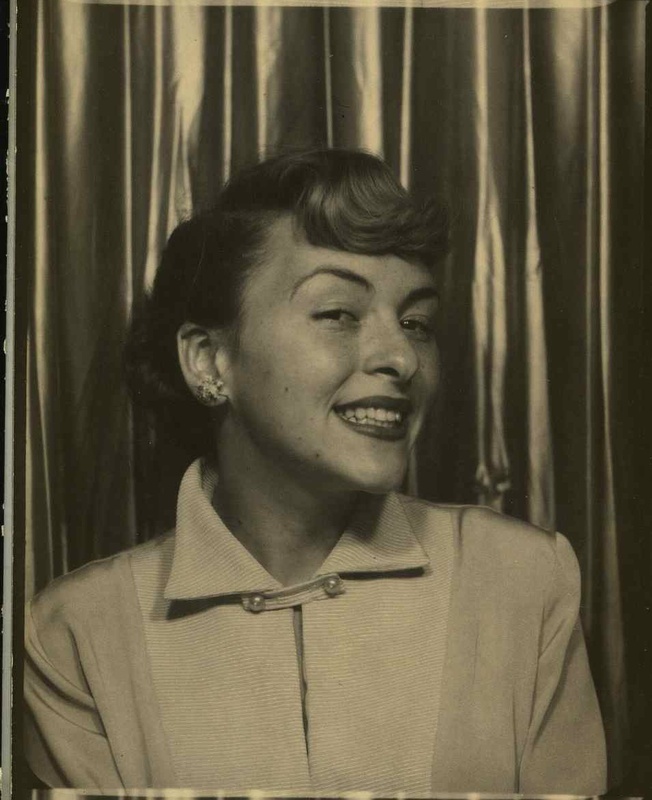 Unidentified lady in 1950s photobooth strip from Germany. It was listed as Stripe of Young Woman, which is appropriate given the visual effect of the backdrop curtain. I bought this strip of photos from Ebay (of course!) but this one is sentimentally special because it was posted to me at my address in New York City, when I had an apartment there on Beekman Place. For two whole months I was a resident of that great city, with my own place, a gym membership, a favourite local diner and a cool local friend called Kelly. These two are having a good laugh in what appears to be a relatively recent photobooth strip. I can only imagine how this ended up being sold online so soon after its creation. Was it one of those not-quite-perfect sets that ended up discarded on the ground, prey to someone like me, who loves a found photo? This is another lady whose beautiful face and eyes draw me in. She is from Germany and given the cloche hat the date of the photos must be the 1920s. This series of eight photos (many of the earlier booths took eight consecutive shots rather than the four we see today) is unusual due to all the original number being present. They look to be perfect for an animated gif but I thought I would try the slideshow option to see how that looked. If you hover over the image a control bar appears and you can fast forward through the images to get a bit of an animated feel. The original photos are below. When I published this animation the other day, the movie was static until clicked. That opened a link to another page where the gif played and the image was very large. Apparently the size of the original files was the issue. Thanks to Lemuel from the blog History Geek for telling me why it wouldn’t play automatically and for telling me how to fix the problem. If you are reading this blog you will likely find a lot to interest you at History Geek, so check it out here.